The CFA Institute Research Challenge is sponsored by CFA Institute and locally hosted by the CFA Society New York (CFANY). The CFA Institute Research Challenge is an educational initiative in which leading industry professionals teach business and finance students how to research and report on a publicly-traded company. CFANY originated the competition fifteen years ago (as the “Investment Research Challenge”) as a means to promote best practices in research among the next generation of analysts. Training in Research and Report Writing: Students receive training by attending CFANY-sponsored seminars on Tools for Analysts, Presentation Skills, Report Writing, and Ethics. Seminar instructors are selected by CFANY. Analysis of a Public Company: Teams research the same public company, selected by CFANY, including a question-and-answer session with company management. Mentoring by a Financial Market Professional who advises and critiques the team’s report. Assessment of Written Reports: A group of volunteer graders selected from CFANY’s membership assess the written research reports. First-Round Presentation to High-Profile Wall Street Experts: All teams present their research to Wall Street experts. The experts choose the “final four” who have the strongest research to present their final report. Final-Four Presentation to a High-Profile Wall Street Experts: The “final four” present their research to a panel of respected Wall Street experts. The winning team is selected based on the combined scores for the written report and the presentation. The winning team advances to the Americas Regional to compete against other North American teams in Boston, MA on March 19 & 20, 2018. Congratulations to 2018 Regional Champion Marist College! A team of students from Marist College won the 2018 New York Region CFA Institute Research Challenge on March 2nd. 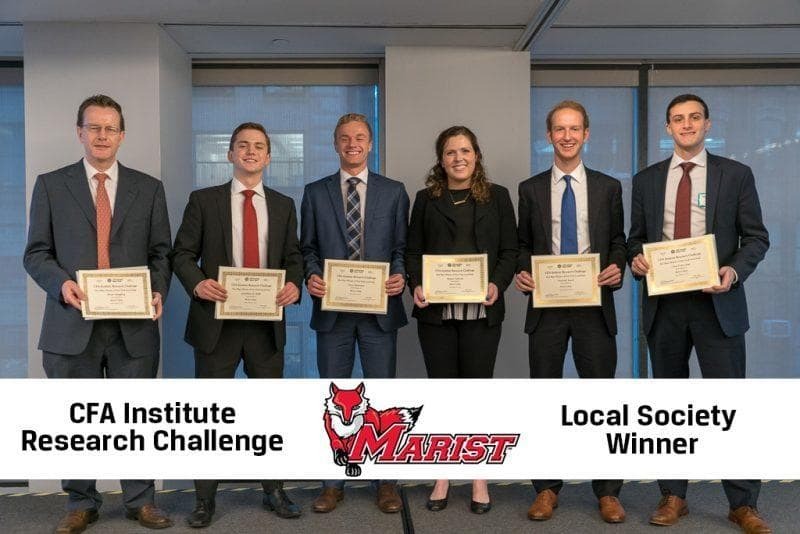 As the local society winner, Marist College will represent CFANY at the Americas Regional competition on March 19-20 to be held in Boston, MA. NEW YORK, NEW YORK — Marist College entered the CFA Institute Research Challenge for the for time three years ago. In that short period of time they became this year’s local champions, and will be representing CFANY at the Americas Finals. This year the students were assigned Domino’s Pizza as the subject company. Event host CFA Society New York(CFANY)congratulates team members Jonathan Blake, Maura Sullivan, Steve Morrison, Dietrich Mosel, and Cory Lang, mentor Matt Epstein, CFA, and faculty advisor Brian Haughey, CFA, FRM, CAIA. 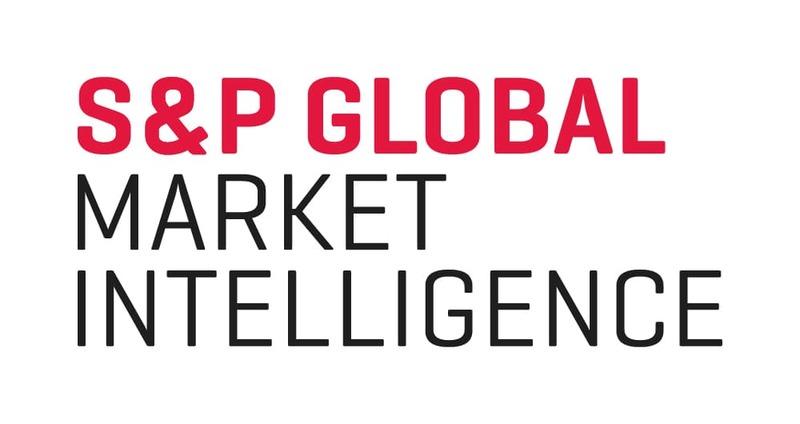 CFANY extends its gratitude and appreciation to this year’s sponsors, CFA Institute, Kaplan Schweser, and S&P Market Intelligence for their tireless support of CFANY’s initiative to reach out to the next generation of financial professionals. Our sponsors provided materials for students to start preparing for the CFA exam, as well as research and analytical tools used to prepare the report for the competition. This year’s competition began in October 2017 with a field of 22 Universities and Colleges, all located within the Tri-State area, representing: Binghamton University, College of Staten Island, Columbia University, Fairfield University, Fordham University, Hofstra University, Iona College, Ithaca College, Macaulay Honors College, Marist College, Mercy College, Molloy College, New Jersey Institute of Technology, Quinnipiac University, Rensselaer Polytechnic Institute, Rutgers University, Saint Peter’s University, Seton Hall University, St. John’s University, Stony Brook University, The College of New Jersey, and The University at Albany. At the kick-off in October each school was assigned an industry mentor from a pool of CFANY volunteers. While the students worked on their equity research, CFANY provided them with educational seminars on best practices for writing an equity research report, how to use the internet for research, and how to make a presentation to a panel of judges. Special thanks to Madhavi Venkatesan, PhD, John Longo, CFA, and CFANY Toastmasters for taking the lead in these seminars. Included in these seminars was a CFA Institute produced online course on ethical guidelines for finance professionals. In January 2017, each team presented a written research report which was then graded by a group of CFANY volunteers, followed by a team presentation to a group of judges in February. The presentation lasted for 10minutes, with an additional 10minutes for Q&A. On March 2nd, the four teams with the highest combined score (written report and presentation) —Binghamton University, Fordham University, Marist College and Seton Hall University—which included an oral presentation and a written report, presented their equity research to a group of judges. Marist College was the winner from this group of finalists. CFANY appreciates all the CFANY volunteers that mentored, graded and judged in this year’s competition: Alex Kosoglyadov, CFA, Alex Pekler, CFA, Allison Poliniak, CFA, Ana Lai, CFA, Anna Toshach, CFA, Andrea Urban, CFA, CAIA, Caitlin Kaldany, CFA, Carol McDermott, CAIA, Charles Gregoro, CFA, Cindy Motz, CFA, Daniel Barile, CFA, CAIA, David Dineen, CFA, Ed Maguire, Eric Fernandez, CFA, Gordon Faux, CFA, Henrik Jeppesen, CFA, CAIA, Isaac Tak, CFA, James Brace, CFA, John Barr, CFA, John Cusick, CFA, John Wong, CFA, Juan Bayuelo, Karl Mergenthaler, CFA, CAIA, Leo Schmidt, CFA, Leslie Lammers, CFA, Marya Savola, CFA, Matt Epstein, CFA, Michael Sicari, CFA, Mike Choi, CFA, Peter Nesvold, CFA, Rafay Khalid, CFA, Rahul Pande, CFA, Ravi Aekambaram, CFA, Rick Konrad, CFA, CFP, Rick Seto, CFA, Rob King, CFA, Ryan Sterling, CFA, Suzana Zayed, CFA, Tim Parker, CFA, Vikas Chelluka, CFA, and Vishal Mishra. CFANY is continuously looking for volunteers to participate in this enriching and rewarding initiative, as part of the University Outreach Program. If you are interested in helping, please contact Mario Carias at [email protected] or at 646 871 3407. A team of students from Seton Hall University has captured the New York Region CFA Institute Research Challenge crown. As the local society winner, Seton Hall will represent CFANY at the Americas Regional competition in April, held at the Seattle, WA location. NEW YORK, NEW YORK — A team of students from Seton Hall University has captured the New York Region CFA Institute Research Challenge crown. Event host CFA Society New York (CFANY) (2016-’17 congratulates team members John Gallagher, Jonathan Glincman, Kathleen McCarthy, Mark Moskwa, Anthony Pescetto, mentor David Dineen, CFA, and faculty advisor Tony Loviscek. As the local society winner, Seton Hall will represent CFANY at the Americas Regional competition in April, held at the Seattle, WA location. 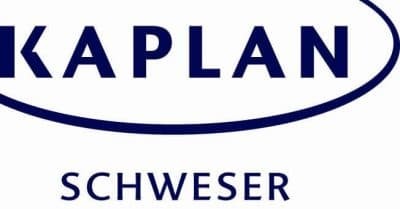 CFANY extends its gratitude and appreciation to this year’s sponsors, CFA Institute and Kaplan Schweser, for their tireless support of CFANY’s initiative to reach out to the next generation of financial professionals. We also thank Factset for providing the competing students with the data necessary to do all required research. CFANY appreciates the participation of this year’s subject company, Dominion Resources, and specifically Thomas E. Hamlin, CFA, Vice-President-Financial Planning & Investor Relations, for taking the time to make a company presentation to the students. This year’s competition began in October 2016 with a field of 22 Universities and Colleges, all located within the Tri-State area, represented: Binghamton University, College of Staten Island, Fairfield University, Fordham University, Hofstra University, Iona College, Ithaca College, Marist College, Mercy College, Molloy College, New Jersey Institute of Technology, New York University, Pace University, Quinnipiac University, Rensselaer Polytechnic Institute, Rutgers University, Seton Hall University, St. John’s University, Stevens Institute of Technology, Stony Brook University, The College of New Jersey, and The University at Albany. In January 2017, each team presented a written research report which was then graded by a group of CFANY volunteers. On March 10th, the four teams with the highest combined score—Binghamton University, Fordham University, Marist College and Seton Hall University—which included an oral presentation and a written report, presented their equity research to a group of judges. CFANY appreciates all the CFANY volunteers that mentored, graded and judged in this year’s competition: Allison Poliniak, CFA, Ana Lai, CFA, Andrea Urban, CFA, CAIA, Brian Toth, CFA, Carol McDermott, Charles Gregoro, CFA, Cindy Motz, CFA, Daniel Barile, CFA, CAIA, David Dineen, CFA, Dinesh Sundrani, CFA, Ed Maguire, Eric Fernandez, CFA, Geeta Kapadia, CFA, Gordon Faux, CFA, Greg Dienna, CFA, Henrik Jeppesen, CFA, CAIA, Isaac Tak, CFA, John Cusick, CFA, John Wong, CFA, Juan Bayuelo, Karl Mergenthaler, CFA, CAIA, Ken Lassner, CFA, Leo Schmidt, CFA, Leslie Lammers, CFA, Mark Bhasin, CFA, FRM, CAIA, CMT, Marya Savola, CFA, Matt Epstein, CFA, Mike Kiernan, CFA, Rafay Khalid, CFA, Rahul Pande, CFA, Rick Konrad, CFA, CFP, Rick Seto, CFA, Ruth Fialko, CFA, Salvator Tiano, CFA, Sandy LaBaugh, CFA, Stephen Mulholland, CFA, Suzana Zayed, CFA, Tim Parker, CFA, and Vishal Mishra. CFANY continues to look for volunteers to participate in this enriching and rewarding initiative, as part of the University Outreach Program. If you are interested in helping out, please contact Mario Carias at [email protected] or at 646 871 3407.